Sporting a Red Sox hat and a leather jacket, Aaron Gushin, a freshman economics major, may not stand out to you on your walk to class in the mornings. 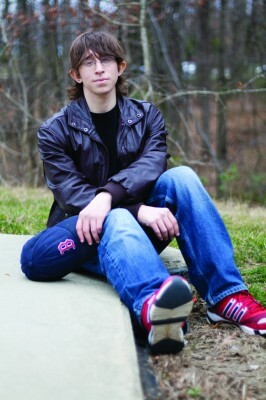 Although his baseball hat may appear conspicuous to some Masons students, the rest of him is fairly ordinary—long brown hair, medium height and medium build. But there is something about Gushin that sets him apart from many: He has Asperger’s syndrome (AS). As defined by the National Institute of Mental Health, Asperger’s syndrome is defined as a neurological condition, one generally considered a form of autism, that causes social impairment, communication difficulties and repetitive and stereotyped behaviors. “Sometimes I feel like I’m a different type of species,” Gushin said. Being a relatively new discovery, AS is a concept many find hard to understand and because of that, difficult to treat or work with. It is this lack of societal understanding, Gushin says, that led him to start a blog to catalogue and document his experiences while at Mason. “I needed to change something for myself, and I just felt putting into words, into writing, all this stuff I’m always thinking, would help me to do that,” Gushin said. His blog, titled “The Lost Martian,” comes with the heavy connotation of being disconnected from others, a sentiment Gushin feels strongly about. Gushin pauses as he finds the right words to define his Asperger’s on his own terms. “I imagine it as having a brick wall underneath my skin, so that I can usually understand what’s coming in, but it’s a lot harder for me to get things out,” Gushin said. It is this brick wall that is the cause of Gushin’s inherent struggle to communicate in the way most people do. “I don’t have the same social boundaries other people do, especially when it comes to verbalizing my thoughts. If I’m going to cuss, I’m just going to cuss. I’m not going to tone it down for a different audience,” Gushin said. It difficult to find a place as a student with Asperger’s. Active Minds is a Mason organization devoted to raising mental health awareness on college campuses by breaking down the negative stigma associated with such issues. Despite the good work the group does, Gushin found that it was not for him. “The focus of the group is things like depression or weight issues and body issues. And for me, it’s not like that. This is a permanent thing. I can’t fix it. It’s not something that can be changed. It’s not something where I talked to a psychiatrist and one day I feel better about. It is an actual simple genetic difference between me and 90 percent of the rest of the world,” Gushin said. Gushin says he is not advocating for an exclusive Asperger’s community. He believes most individuals with Asperger’s possess the ability to converse with others at a higher level than individuals with more severe problems like Down syndrome. However, he does see room for improvement among campus-wide understanding for such issues. “I feel as though we are being treated differently, sometimes negatively because we exhibit some of the same traits as people with more severe disabilities,” Gushin said. Gushin combats these experiences and feelings by writing about them. He hopes that by writing about them, he can shed some light on Asperger’s and eliminate current notions of the syndrome.